Challenging the big brands with our 'Double the colors - Half the price' presentation set! 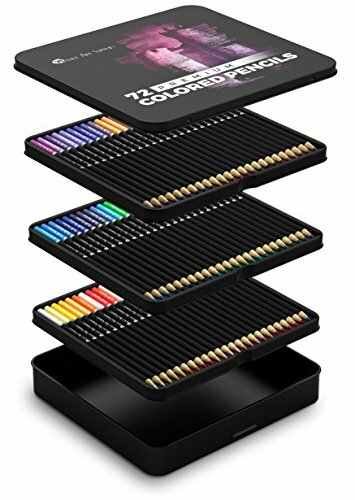 Castle Art Supplies have built a great reputation for their high quality, value for money art products and are very excited to launch their 'new and improved' colored pencil set featuring double the range of colors of their original '5 Star Rated' sets. Perfect for sketching, coloring, drawing or doodling - our cleverly compact set is just bursting with color that will keep everyone from aspiring artists, coloring book fans, doodlers and the 'back to school' kids super happy. Oh, and Mom and Dad will be thrilled with a genuine value for money purchase too! Strong and reliable lead core to limit breakages (giving your pencil sharpener a well-earned rest). Exclusive 'Color Happiness Guarantee' which means that you can purchase this set with complete confidence. If you're not completely satisfied, we will replace or refund with miniMom fuss. We've enjoyed growing a loyal customer base over the last three years and look forward to welcoming you to our Brand.